BlogcompanyHow Do Clean Agent Fire Suppression Systems Work? How Do Clean Agent Fire Suppression Systems Work? If you have ever been through the aftermath of a fire, you know that the fire suppression system that you use can be incredibly effective when properly installed. However, the reality is that water and many oily chemicals can cause as much damage to your business as the fire itself! Fortunately, AAA Fire Protection offers an innovative approach to solving this problem — clean agent fire suppression systems. These chemical protectants are safe and reliable, and will help protect your electronics and furnishings while defending against fire. These high-tech waterless fire suppression systems work by targeting only the areas where they are needed and are the ideal solution for many business applications. 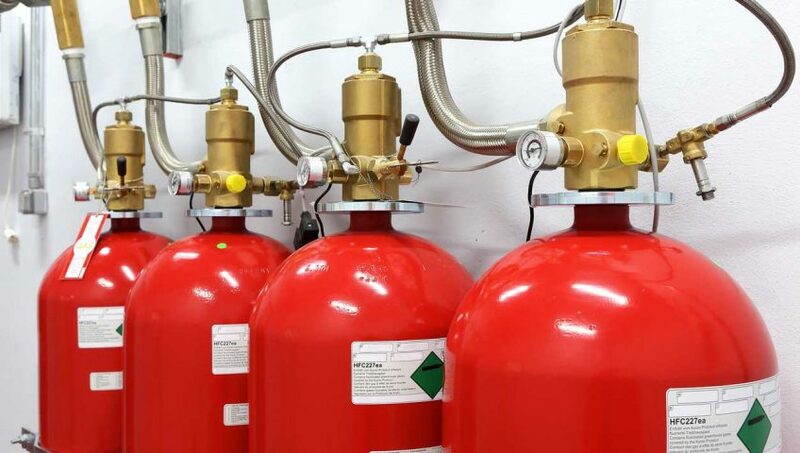 Waterless fire suppression systems work by releasing a gas or mixture of gasses into the air, generally with the aim of reducing the amount of oxygen in the air that feeds the flames. The clean agent, such as CO2, is often stored a distance away from the area it will be protecting. A network of pipes connected to nozzles are spaced by professionals throughout each potential fire location. Clean agent fire suppression systems commonly include three key elements: notification devices, control panel and smoke detectors. The smoke detectors are the first line of defense and activate the control panel when smoke is detected. The control panel then sends word to the notification devices and through to the piping to begin releasing the waterless agent into specific locations. Occupants will see and hear the active notification devices and know that the fire suppression agent will release soon. Employee Protection: Since this agent can be used in both rooms that are occupied and those that are not, it’s a full-service system that can quickly extinguish fires and protect your valuable human resources. Quick Response: Not only will clean agents quickly extinguish a fire, they can also minimize the amount of damaging smoke and soot that occurs as a byproduct of the fire. Minimal Damage: You won’t need to worry about damage from traditional fire extinguisher liquids that can leave behind a greasy residue or water — which is incredibly damaging to electronics. Your your business will be back up and running much more quickly with a clean agent fire protection system. Green Solution: Clean agents are environmentally friendly, safe for the environment and will not deplete ozone from the earth. AAA Fire Protection teams are professionally trained and certified to accurately place clean agent fire protection systems in a way that ensures the safety of your workplace and limit the damage to sensitive electronic equipment and danger to staff. Contact us today at 800-778-7807 to learn more and see why businesses as diverse as McDonald’s, Facebook, Costco and Google trust us to protect their business. We will evaluate your current fire suppression system and make recommendations for upgrades or replacements — but only if you need them!